Mary Catterlin built a dugout canoe out of a giant cottonwood tree. 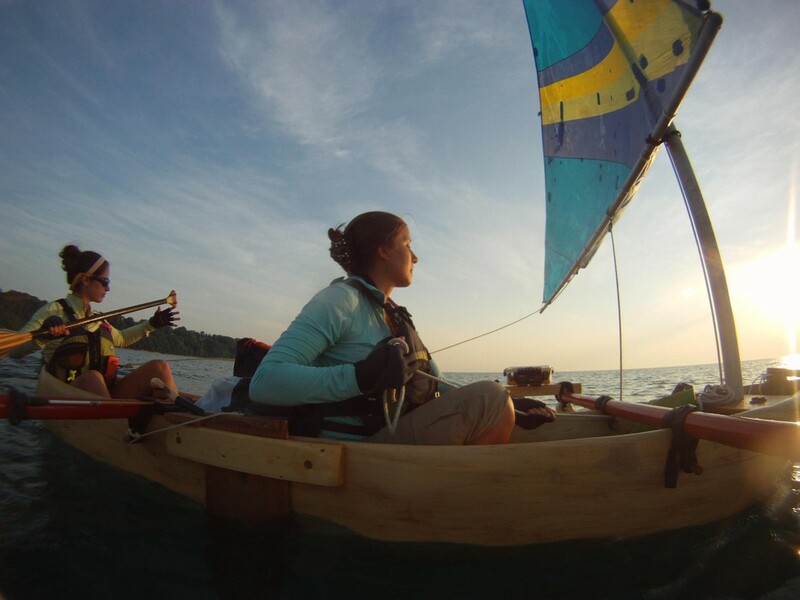 Her friend Amy Lukas helped her near the end and together they circumnavigated Lake Michigan. 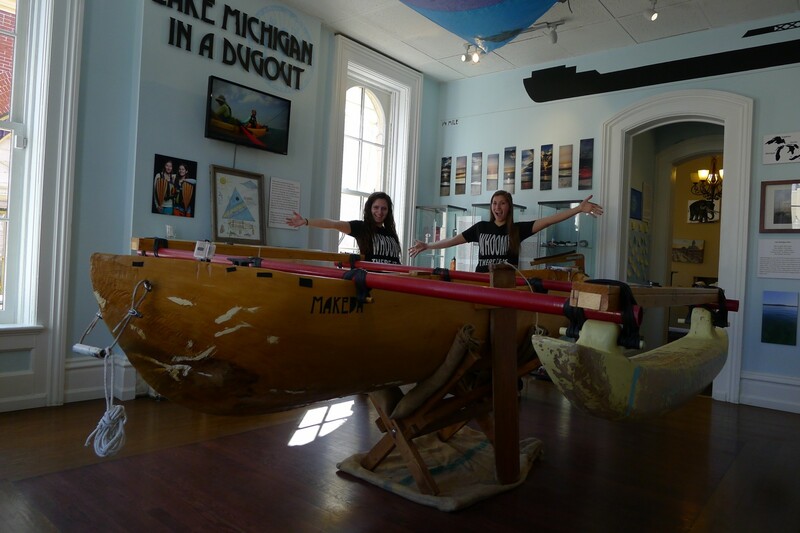 They recently received a Paddlers of the Year award and the story of their journey, and the boat, “Makeba,” that took them on it is currently on exhibit at the Porter County Museum of History in Valparaiso, Ind. The girls have done several interviews regarding their adventure, and it’s all on their blog. The Dodgy interview focuses on beer, food, movies, music, and relationships. The name of your canoe, Makeba, invokes music. Did you bring any music with you on the trip and if so, who were the artists of choice? Amy: We brought Mary’s iPod, so in honor of Makeba our send-off music as we paddled west from Beverly Shores was Miriam Makeba’s song “Pata Pata.” Unfortunately, we had a storm come up quickly, resulting in the iPod getting water-logged on the very first day of the trip. We weren’t able to use it again. We entertained ourselves by making up songs as we paddled and sailed. Neither of us has the greatest singing voice, so it was good that we were the only people hearing each other most of the time. Sometimes we would go into sing-song voices while communicating with each other, singing normal everyday sentences like we were in an awfully hilarious musical. Mary: Otherwise we would attempt to sing songs such as The Darkness – “I Believe in a Thing Called Love,” Hues Corporation – “Rock the Boat,” and our favorite Hall and Oates song – “You Make My Dreams Come True.” When we had enough juice in Amy’s iPhone we would play Andrew Bird on Pandora. We love his music. What was your best and worst meal on the journey? Amy: At the Straits State Park in the UP we made our worst camping meal by far. We tried to make “spaghetti,” which resulted in us cooking some pasta that perhaps had gotten a bit damp…the noodles tasted stale. The “pasta sauce” was a powder that you mixed with boiling water. It turned out to be just a salty pink liquid. The “meatballs” were rehydrated beef jerky. This was tough to swallow as we smelled actual hamburgers being cooked in nearby campsites. We also tried to cook some lentils, but they ended up chewy and the seasoning packet that went along with them made it extremely salty. After a few bites we knew we’d created a disastrous and inedible dinner. In the end this meal resulted in us ordering pizza since we were back in civilization. Mary: We surprisingly had a lot of great food on this trip. And it’s amazing how great everything tastes when you’re paddling for 8 to 12 hours a day. Our favorite thing to make on our tiny camp stove was a conglomeration of pancake mix, apples, dried fruit, nuts, peanut butter, and a bunch of Nutella. It was great any time of day – breakfast, lunch, dinner, dessert. Everything truly is better with some Nutella on top. What was the best beer you had? Was there a worst? Both: Best beer – New Glarus Brewing Co.’s Spotted Cow or a strong porter shared with new friends at the Saugatuck Brewing Co. in Douglas, Mich. The worst beer of the journey was warm Coors Light. The good company we had that day made this lousy beer experience worth it though. If you could have brought one celebrity on part of the journey, who would that have been? Both: We’ll probably have to go with musician Andrew Bird on this one. He has excellent whistling skills, not to mention he’s lightweight and looks like he can fit comfortably in small spaces. We didn’t have too much room to spare traveling in Makeba. Plus, we always wanted to adopt a pet bird mascot for the boat, so Andrew Bird is extremely fitting. If a movie was made about this journey, who would play you two? Both: We’re not sure. Wes Anderson would definitely have to be the director though. Perhaps Emma Stone and Natalie Portman, but Wes would have the final say. We’d be happy to just be paddling in the background of one of his movies because they are all so amazing. What is your favorite water/boat-themed movie? Both: “The Life Aquatic with Steve Zissou.” Easily. Are either of you in a relationship and if not, have you found yourself being “hit on” more often following the trip? Mary: No serious relationships currently. We’ve had plenty of guys say they feel emasculated by us after hearing our story, so I’m not sure if that’s a selling point for hitting on us too hard. There don’t seem to be a ton of twenty-somethings in the canoeing community these days. 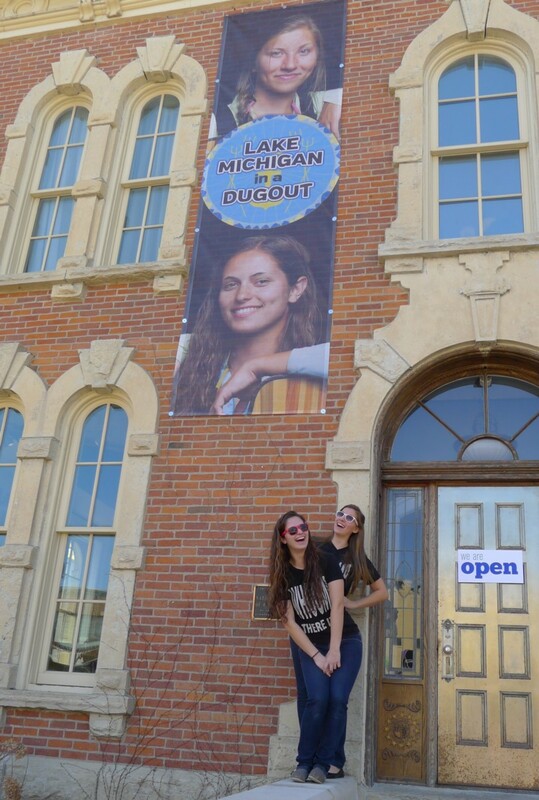 Amy: We currently have the boat and photos from our trip on display at Porter County Museum and there is a huge banner hanging outside of the building featuring our faces. We had no idea this banner was getting printed, so we were quite surprised. We’ll see if our four-foot faces attract any attention. Amy: There was this one wavy day when waves were crashing over the side of the boat. One wave that crashed in was carrying a small fish. Mary: I’ve never heard Amy scream like such a little girl before. Probably her girliest moment on the trip. Amy: I definitely screamed like a little girl and jumped on top of all our gear – practically in Mary’s lap. I watched the fish swim around in all of the water that gathered in the bottom of the boat before eventually catching it in a small collapsible bucket and throwing it overboard. Mary: Lake Michigan in general didn’t surprise us much – we knew we had no control over her and that she would do what she wanted. So I guess she was never entirely predictable, but we were expecting her to be that way. Amy: There are so many kind people around Lake Michigan. We were happily surprised and humbled by the generosity and kindness we received from people as we traveled around the lake. They are the ones who helped make this journey possible and successful. I saw something on your blog about some people being surprised when they found out you two owned Makeba. Why do you think that was? I wouldn’t find it surprising at all. You girls look like adventurers. You have that adventure-girl look. A compliment, of course. Amy: I think people were surprised at the fact that we were two young girls and not two old burly men with scruffy beards. It’s a stereotype we challenged. 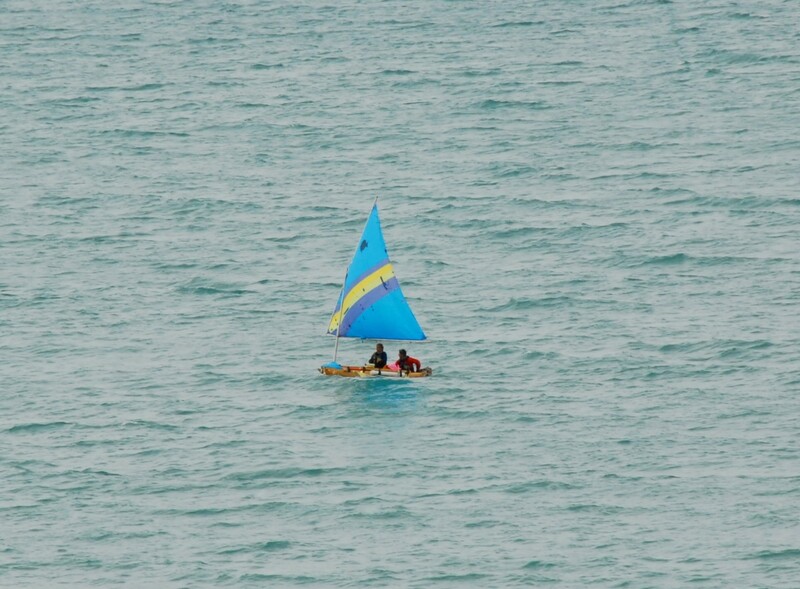 Building a boat out of a log and then circumnavigating Lake Michigan, it’s not a thing that girls typically do. Or anyone, for that matter. Mary: People saw us in our sun protective clothing with all our ridiculous gear, so they could usually match us with Makeba after scanning the beach for who she may belong to. We were dressed the part, but not casted predictably. Mary, has anyone told you your last name sounds like the name/style of a boat? Nope. That’s a first. If you pronounce it as “Catter-line,” I think I can hear it. I like where you’re going with that idea though. Amy and Mary met in high school while playing soccer together and sharing a photography class. “We both love Lake Michigan and getting into shenanigans, so we were a perfect fit for each other and for this trip,” Mary says. Mary and Amy with their exhibit at Porter County Museum of History.